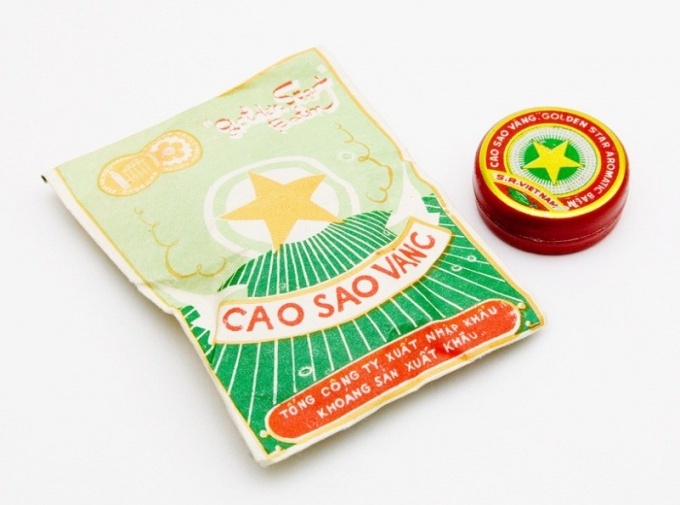 Balm "gold star" popularly called "Asterisk" or "Vietnamese star". This medicinal substance of a brownish or yellowish hue has a specific aroma. Use "Asterisk" in preventive and curative purposes. In the "Golden stars" are paraffin oil, menthol, aromatic eucalyptus oil, clove essential oil, peppermint oil, oil of Chinese cinnamomi and other valuable components. This "drug" is used as a local irritant, antiseptic, distracting and pain reliever. For example, the "Vietnamese star" is prescribed in the initial stages of diseases of the musculoskeletal system in rhinitis and motion sickness, to enhance blood circulation, etc. But the "Stars" there are contraindications. So, this drug is contraindicated in persons with hypersensitivity to any of its ingredients. Also the balm does not recommend the use in the treatment of children under two years of age. It is not recommended to use "Stars" for skin diseases and other disorders of the skin. If after heavy physical work in the area of the spine there is a strong pain that increases with movement, can save the balm "Vietnamese star". For this you need to RUB the affected area with balm on top and wrap the back with a woolen scarf or scarf. Preferably such procedures do every night before bed and during the week to avoid heavy physical loads. Combating insomnia through the use of balsam "gold star"
Often the usual sleep disorder is directly related to emotional excitement. To relieve tension and speed up the process of falling asleep, and recommend to the area behind the ear near the border of hair growth (at the level of the lower edges of the auditory holes) to apply a little "Sprocket" and massage this point for 40-60 seconds in a clockwise direction. In addition, you should limit the mental and physical exertion (especially in the second half of the day) and in no case do not overeat before bedtime. To get rid of the numbness and weakness in the extremities will help to "gold star". To do this, RUB hands or feet with this balm, and the top legs well wrapped up. To enhance the therapeutic effect, massage using "Stars" should be combined with pine needle baths. Wellness course can last from 3 weeks to 2 months. Treatment of colds with the help of "Vietnamese star"
For a short period of time to get rid of a cold, it is recommended to be treated by an Asterisk. Gently massage this balm is applied on the neck, the throat then tied a woolen scarf and drink warm tea with honey. If this procedure is done at night, in the morning you will feel much better.